So money is tight. I’ve told you that before. It’s okay, I’m not complaining. I’m learning actually. I’m pretty good at budgeting and stretching a dollar and I’ve always been the queen of planning. I view this era of my life as a challenge and as a growing process, so it isn’t bad. Now that I have written the “rah, rah” section I will now begin the “huh, this is . . . fun” section. Due to lack of funds (see above: Budget) and lack of dates (see entire blog: Single) I now occasionally find myself in the enviable position of having a Saturday night with absolutely nothing to do. Nothing. Not a thing. No thing. At all. Enviable, right? When that happens I’m not sure what to do with myself. Usually. However, lately I seem to have overbooked myself professionally and socially and so when I understood that I was going to have a weekend that did not include people in any format at all, I began to rejoice. Honestly, I was getting rather emotional and snippy as I had had no alone time in weeks. Also, remember when I hired Ernesto, my house cleaner, and I was jazzed that he came every two weeks and folded my toilet paper ends into points? Remember how I loved him and swooned over his work? Well, I miss him (see above: Budget). My house does too. These were my plans when I went to bed Friday night: to sleep as late as possible (7:00 a.m., baby! I am a sloth! ), and to clean my miserable (miserable) wreck of a house. Do you think it is sad? Do you feel a little sorry for me? Don’t! It was marvelous! 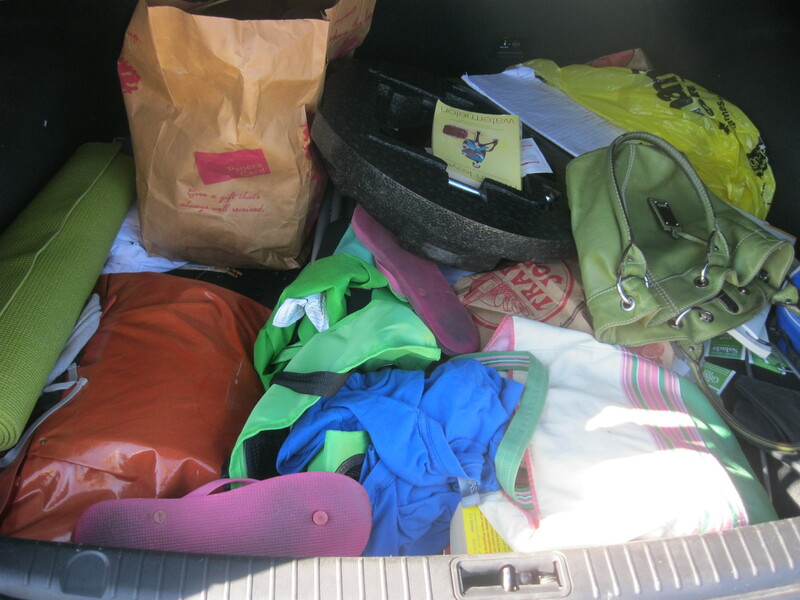 – Two carloads full of stuff were taken to Goodwill, some mine and some Kasi Starr’s. (There is another story here – tune in later for that episode.) By full, I mean there was room for me and that’s it. I could see out the front driver’s side windows and that’s it. It, I tell you. – The areas where one of the kitties vomited unspeakable things onto the carpet were shaved off with a razorblade. Gross. I’m currently not speaking to Murphy or Miss Kitty. – My garage is completely organized according to girl code. Boys, you have no dog in this fight. My garage is perfect. I do not need your advice about how to arrange my storage space according to your strict and non-negotiable standards of tool/garden object/car/cleaner areas. – The interior of my car was vacuumed and scrubbed. 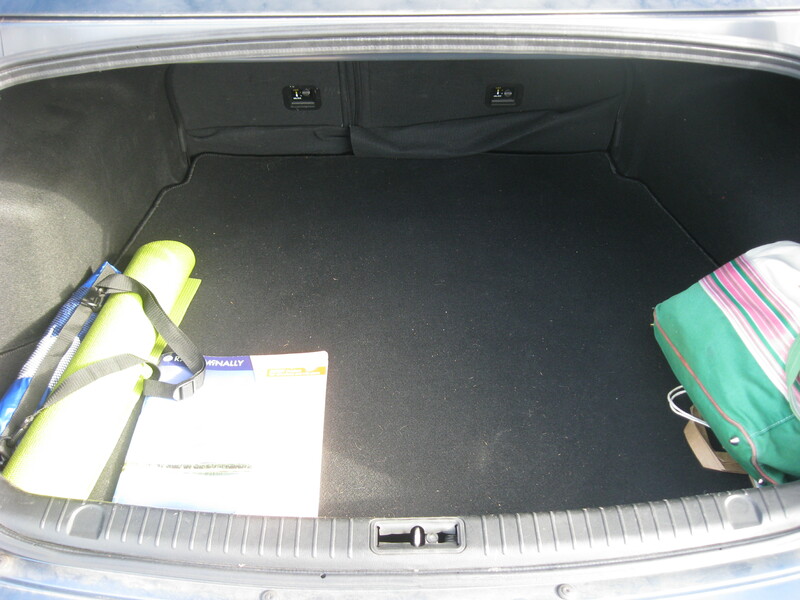 – The trunk of my car was emptied and vacuumed. I hope you guys caught that. The trunk. Of my car. That I have not really touched since April when I was laid off. Was cleaned out. It was sad a little. I had a whole life at that company and that whole life was stuffed into my trunk where I did not have to face it. But after I threw a whole bunch of that life away, I felt lighter somehow. Also, look at it! – I cut my thumb open with a vegetable peeler. Not only was I not cooking anything, but I had been whipping about a razorblade all morning with no ill results, yet the moment I washed the dishes, I nearly bled to death in the kitchen. It was a scary time. – I lost my car keys. How I did that in this spotless, completely organized house is beyond me. I don’t know how you guys stand me. Really. I can barely stand myself. – I organized my closet. And here, my friends, is Addiction, Part Two. You see all that? 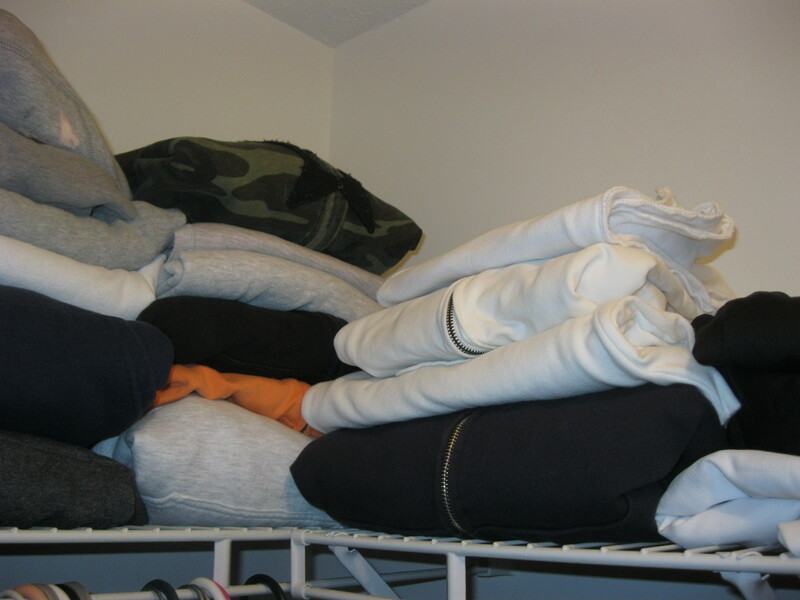 Those are hoodies. I love them. I can never have too many. I am on the never-ending quest for the perfect one and despite what you see here, I have not yet found it. 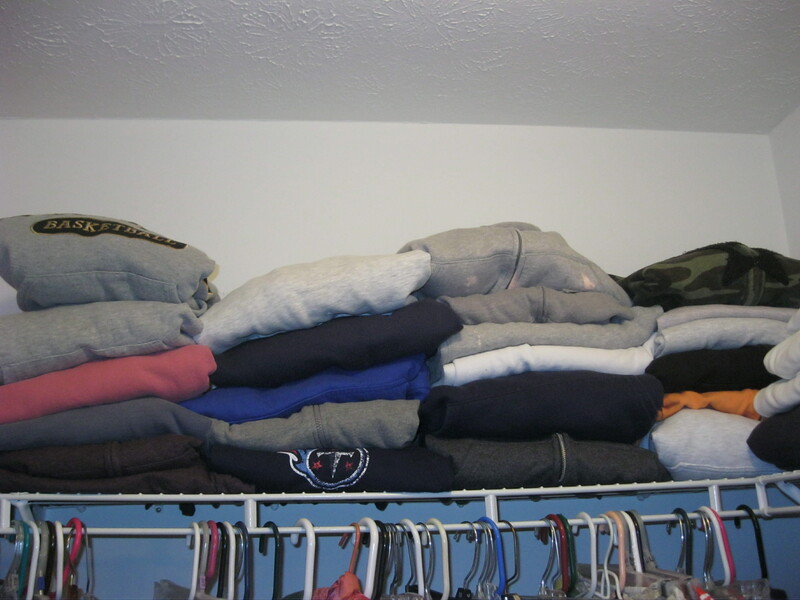 One of those hoodies was stolen from an ex-boyfriend. It was literally the only thing I kept from that relationship of one whole year and my whole heart. Two of them I stole from a guy I went on two dates with. Four of them I stole from Coach (you see how I’m his fake wife?). Martie recently purchased one that I covet and the minute she gives even a whiff of letting me borrow it, it will be mine. That gray one there in the middle, it’s my favorite. That Titan’s one has a matching scarf Madre knitted for me. That pink one is for sleeping. Madre tried to borrow the purple one for just a week or two and initially I said yes, but as she was trying to put it on, I kept pulling it off and not letting go and eventually she just gave up and stuck it back in my closet. Some of them are specifically for use in the gym. Some of them are for house cleaning. Some of them are for dates (as if). Some of them are to be paired with jeans on casual Friday. Some of them have matching socks and t-shirts although all of them look good with a lacy camisole. That one up there with the bleach stains? You should know that the zipper is broken meaning I have to wrangle it closed with pliers, and it is two sizes too big, yet I cannot seem to part with it. You want me to go on? No? Really? What were we talking about? I think I got ever so slightly sidetracked with the hoodies and now have forgotten the entire point I was trying to make. But, uh, I’m on a budget (perhaps it was how you can have a no-money fun weekend? By cleaning?) and I have addictions and these are first world problems. P.S. I also have a wrapping paper addiction and am on my second year of a three year wrapping paper purchase ban. I also seem to have great affection for the long sleeved t-shirt. If any of you forgot to buy me a birthday present and feel pretty bad about it, I could give you a few suggestions. Hello! I’ve been following your weblog for some time now and finally got the courage to go ahead and give you a shout out from Huffman Texas! Just wanted to tell you keep up the fantastic work!